Mushrooms are the craziest little things. In a package or loose, they seem so dry, but stick them in a saute pan for a few minutes and suddenly they’re moist and delicious! The same thing happens when you chop them up in a food processor. I thought I would need to add more sour cream to bind the mushrooms together, but those crazy little mushrooms handled it on their own. I could happily eat this on toasted french bread every single night. It would be delicious warm, too — just assemble the canapés and toast them on a low setting for 5 minutes. YUM! 1. Rinse mushrooms briefly under cold water to remove dirt. 2. Place mushrooms and garlic into a food processor, breaking any large mushroom in to pieces. Pulse until mushrooms are finely chopped. 3. Add sour cream, parsley, parmesan, salt and pepper. Process until blended. 4. 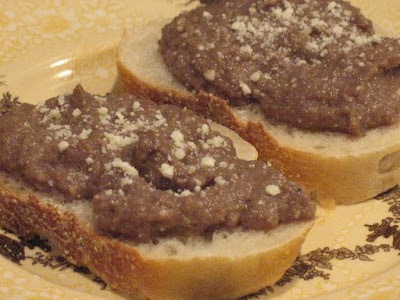 Spoon mushroom mixture onto slices of bread. Garnish with extra parmesan cheese, and serve.